Where is the Rally Squirrel when you really need him? 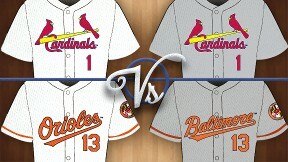 The polls have closed, our Battle of the Uniforms is officially over and the No. 1-seeded St. Louis Cardinals wound up suffering their toughest defeat since at least the final three games of last season's National League Championship Series -- and perhaps as far back as the 1985 World Series. Cardinals fans can't blame this one on a bad call by Don Denkinger, either. The Baltimore Orioles decisively beat the Cardinals in the championship round -- also known as the Battle of the Birds -- receiving 59 percent of vote compared to 41 percent for the Cardinals. St. Louis fans must be getting really tired of losing to teams with orange-and-black uniforms. The Cardinals weren't the only high seed to disappoint, though. All the most famous classic uniforms -- the Yankees' pinstripes, the Dodgers' blue, the Tigers' Old English D, the two Cardinals balanced on a bat -- fell short in the end, while the lesser-heralded Orioles go home the winners. Which is not to say the Orioles are undeserving champions. Far from it. Baltimore's uniform has some great style features, beginning with those wonderful orange and black colors (always an outstanding look) and extending to the great cartoon Oriole logo on the cap (much preferable to the ornithologically correct version). It's a classic uniform that looked great on Brooks Robinson, Frank Robinson and Jim Palmer, and it still looks great on Adam Jones, Matt Wieters and Chris Davis. can we talk about those home caps with the white-panel front? This is a design style from the fashion-challenged late '70s and early '80s, and it still looks just as bad as it did then. Manager Buck Showalter famously griped about Ken Griffey Jr. wearing his cap backward in the '90s (those darn kids today! ), but he could improve his team's look by loosening up and ordering all his players to wear their cap backward. Apparently, though, our voters either like that cap style or love the rest of the uniform so much that they overlooked it. 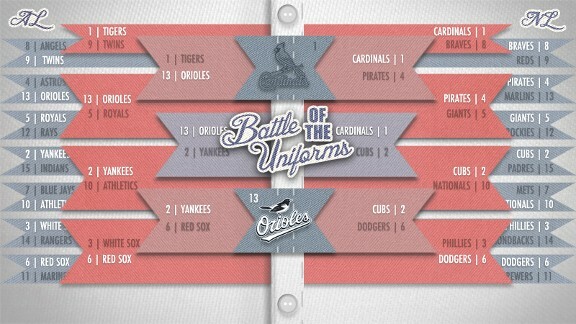 Despite being seeded 13th because of those caps, the Orioles beat higher-ranked uniforms in every round on their way to the championship. Not even Jeffrey Maier could have slowed Baltimore's run. And, hey, maybe the Orioles could wear their new crown instead of that cap. And if not, well, at least the rest of the uniform is outstanding. So, congratulations, Baltimore fans. Our fashion police have declared your team the best-dressed in baseball. Here's hoping the Orioles are also baseball's best-dressed team come October and the postseason.